This photograph shows the rare Super Blood Wolf Moon as it turned a reddish-orange high in the Texas sky late in the night of January 20, 2019. With a windmill’s blades rising in the foreground, I used a telephoto lens to zoom in on both the windmill and the moon. This image is a composite of two photos, each taken to maximize clarity and sharpness. In the first image, the moon was the focal point. In the next image, the windmill was the focal point. 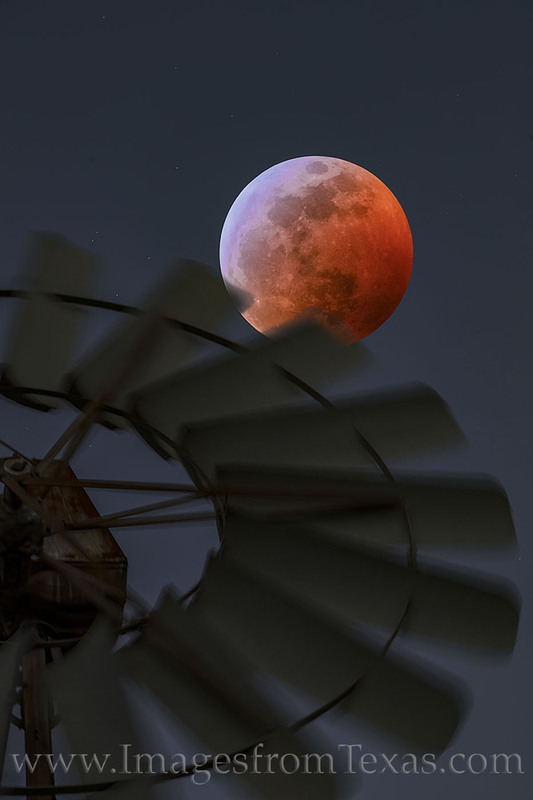 Both were combined using Photoshop to show what the eye can see but the camera cannot capture, creating a sharp image of the windmill, maybe 50+ feet high, and the moon, about 223,000 miles away. Photo © copyright by Rob Greebon.